Which Compact Pushchair? For City Use / Travel as Airplane Handluggage: YoYo or Pockit Plus? But fairly recently two pushchairs have entered the market which you can fold up and take onto airplanes as cabin baggage - yes, they fold up that small. They are the Babyzen Yoyo and the gb Pockit. I often see questions asked about them both in online mums groups I'm a member of, so I thought it would be good to be able to review them here. I'm sad to say I haven't owned either of these travel pushchairs, so my lovely friend Lainie offered to help me out. She owns both a Babyzen YoYo and a Pockit Plus. Living in the city with 2 babies, a mere 14 months apart, a small pushchair is essential for this inspirational mama. They make life easier on public transport and in small shops and elevators. She also travels with her babies lots and needs pushchairs that work for all their adventures. ...So why did she choose these two? And what does she think of them? Why do you have both the YoYo and the Pockit? As we have 2 young children we needed 2 pushchairs for travelling, but didn't want to buy a second Yoyo unless we had to as it wasn't intended to be for everyday. 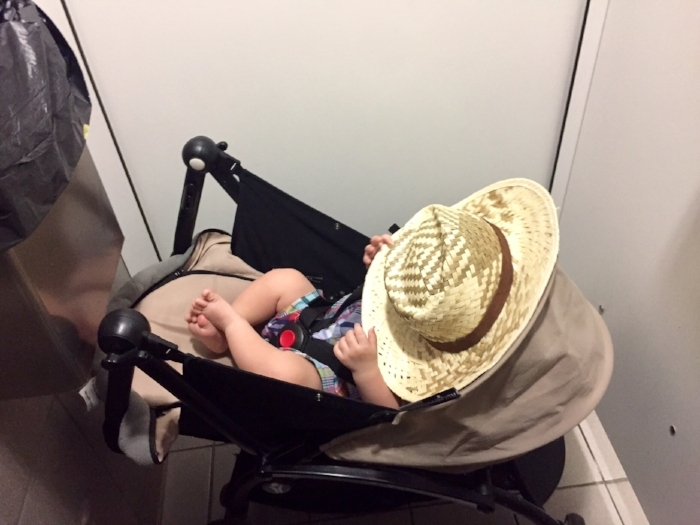 Where can you Purchase these compact travel pushchairs from? Both the Yoyo and Pockit are difficult to find second hand as they get snapped up, the upside is that they have good resale value. Both are stocked in several specialised retail outlets, and of course online. How easy are they each to assemble? The Pockit comes already assembled which is great. The Yoyo is somewhat complicated to put together, even with YouTube tutorials. how do they feel to push? The Yoyo is definitely the luxury compact pushchair. The Pockit is more functional and feels less sturdy. The handles often wobble from side to side. This said recently we sprinted though the airport to avoid missing our flight and it stood up to that pretty well. The Pockit has the option to unlock the front wheels so that they swivel round corners easily (or lock them in rough terrain). How easy are they each to fold up? The Pockit is more complicated to fold up as there are several steps to follow, whereas the Yoyo just requires you to fold the handle bars and click one button before you fold it up. Once you know how, the Yoyo can be folded up almost one handed. The Pockit really needs two hands and at the moment I don't see how to clip the catch to keep it folded up without pressing on it with my knee! How easy are they to fly and travel with? 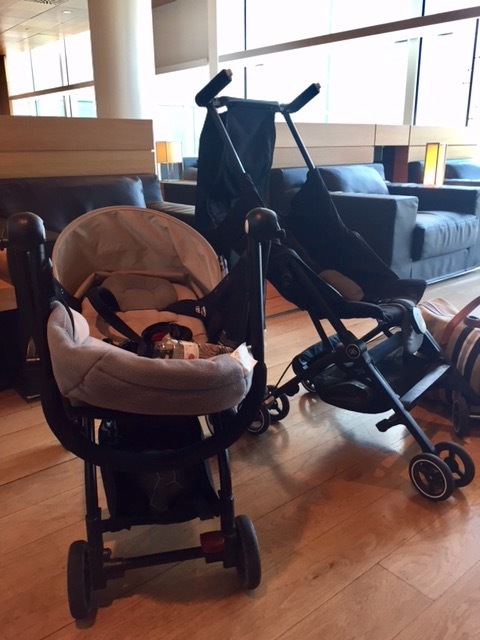 Both pushchairs were accepted as hand luggage on board an Air France flight. We had to access the plane by bus and then go up the steps to the plane. I'd definitely recommend also having either a baby carrier or reigns if you have to access the plane from the runway and not a boarding ramp. The Pockit is smaller but awkward to carry with a baby, it doesn't have a strap and the carry bag isn't provided with the initial purchase. I could carry the Yoyo and a baby really easily, but I needed help from a fellow passenger when traveling with the Pockit! The Yoyo fits in a loo! 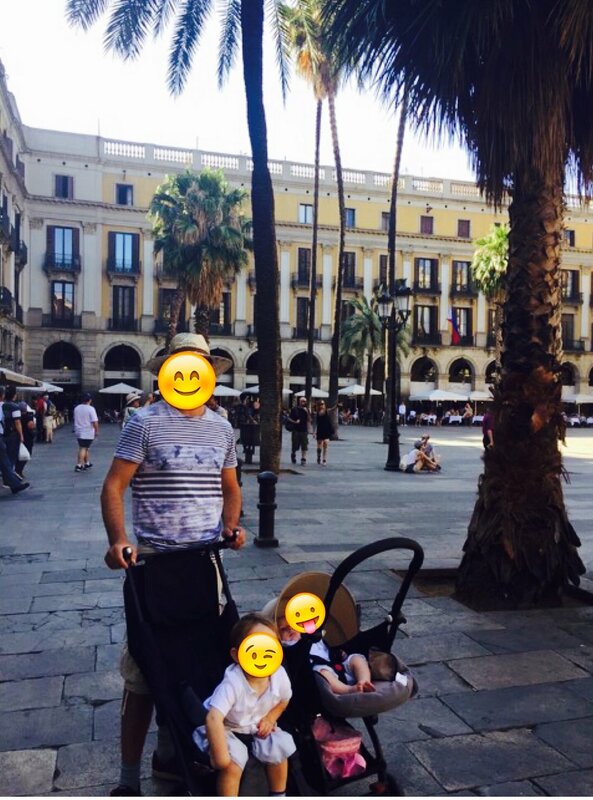 How do these pushchairs fare for everyday use? The Pockit doesn't come with a rain cover and the flip over shade is only for the sun and wouldn't protect from the rain. There is no way to fix a rain cover on. The Pockit is great and light for whizzing through airports and would probably be fine when jetting off to hot countries, I think the child would need to be wearing an all in one winter suit to keep warm and dry in colder, wetter climates as it's difficult to use a foot muff as it wouldn't fold up easily. The Pockit plus has a reclining seat making naps slightly more comfortable. The Yoyo seat reclines further making it super comfortable. Both have a basket underneath allowing you to store the bare minimum. The Pockit storage basket is smaller. The Pockit and Yoyo sampling Michelin starred kids menu room service - they know how to roll! What is your view on the quality of them both? The Yoyo is definitely the more sturdy of the two and has a 0-6 pack so that you can use it from birth The Pockit is suitable for 6 months and up. The Yoyo pushchair was launched in 2013 and is part of the French company: Babyzen. The Pocket pushchair is from GoodBaby (gb) which is a Chinese brand. The Pockit pushchair was recognized as the worlds smallest pushchair by the Guinness book of records in 2014. The Babyzen YoYo+ is £369 (as seen in John Lewis UK). You can find the online retailers for the YoYo across the world here. overall, what do you think of the YoYo and the Pockit and which would you recommend? Both pushchairs are great but not for the same use. I honestly don't regret either purchase. I'm lucky to have both! The Yoyo is the pushchair to buy if you only want one but want to use it if you are traveling, relying on public transport, have limited storage space at home, or if you have a small car boot. It is my favourite all rounder of the two, but is more expensive, bigger and heavier. The Pockit is perfect for someone looking for a second lighter more compact pushchair for travelling or occasional use. It is also considerably less expensive than the Yoyo, but remains expensive for a "second" option. The Pockit really is perfect for travelling. Many thanks to Lainie for helping us all out with her reviews! Unlocking Imaginations. Opening Fairy Doorz. Personalised placemats from Paper Gekko: making dinner time easier!